If you are a seasoned professional interior designer — someone who has been working in the design industry for 20 years or more — you are probably running your own business or a principal in a large firm. Your daily routines are less about doing design and more about project management. Many people who are creative say they don't think of themselves as managers or even business types. The truth of the matter is if you have been working in design for a while, not just doing the design work, but directing others, you are in management. 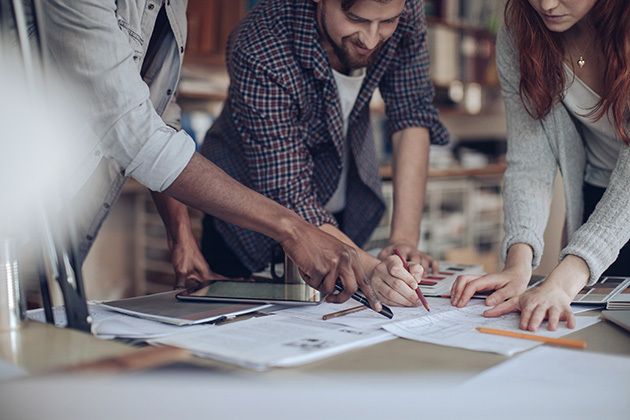 To many younger, less experienced designers this might not be the career path they signed up for — especially if they are only in commercial design. For residential designers, you see this as the way design is done. You need to be able to juggle a multitude of ideas, schedules and people to keep your clients happy. Designers who don't think of themselves as managers need to reconsider what they do day to day. We as designers know that design is more than picking out pretty colors and furniture. It is about completing an interior space. Whether that space is in a residence or a commercial building, the job is the same. If you are not ready to be the one who makes the decisions, who talks to the client, who works with the various personalities on the team, you may want to rethink your career path. Creativity without proper direction can not only be chaotic, but also mentally and physically exhausting. This is when burnout and overload take over the joy that creativity brings. It's not a glamorous job, but project management is a skill that many designers either learn or they don't. It isn't something that is taught in school; it's on-the-job training. Being able to work with various egos and personalities is sometimes determined by our own personality. Creativity and idea generation, on the other hand, is something designers do naturally without thinking about it. But good project management is a skill that is honed by experience and evaluation. Designers tend to look at the world differently. Communication is always going to be the key to making our ideas real, but what type of communication works? Knowing this answer takes understanding of the design process, awareness of what steps need to be taken and what order they come in, as well as making decisions confidently. Our creative skills are tested every time we approach an idea we believe in. If we cannot make that idea a reality, we lose the trust of our clients. Good project management is a way to ensure that our projects get completed the way we imagined it. No matter what the profession, teamwork is talked about constantly. It seems that without teamwork nothing will ever get done. Design is something that is both a solo pursuit as well as a team-driven exercise. Supporting the design process with good management is what helps keep those activities in sync. We all have our design disaster stories that illustrate just how complicated the design process can be. We've worked with difficult clients, team members and other design professionals who transform what we love into something we loathe. Managing the chaos is what will keep our projects on track. So, what do you need to do to achieve good project management and provide favorable outcomes for everyone? There isn't really an answer to that question, because every project is different, but what can be done is consistency with flexibility. Understanding that you are in control of what you do is the first part of understanding project management. It starts with the smallest task — if you are just starting out in this profession, you need to understand that the small tasks are what make the big tasks get done. Remember, a house is only as good as its foundation, and good project outcomes need to have that, too. Creating that foundation is the result of evaluating the outcomes of those experiences. If you only have one design project to evaluate, do it. Think about what happened, take good notes, ask questions of your team, consultants and installers. Talk to your client. Be open to some criticism and understand that every mistake or missed opportunity is valuable. Managing your projects doesn't just happen. It takes planning and the ability to adjust to fine-tune your focus. No project is ever perfect, but we can get as close to perfection as humanly possible. If we embrace both sides of our brain and use it to its fullest, we'll have the outcomes we desire and projects to be proud of.